Reading email is something everyone does with their iPad. The Mail app is arguably one of the most used apps on any iOS device. Most of the time, reading mail is a painless exercise. There are times when it can be downright aggravating too. 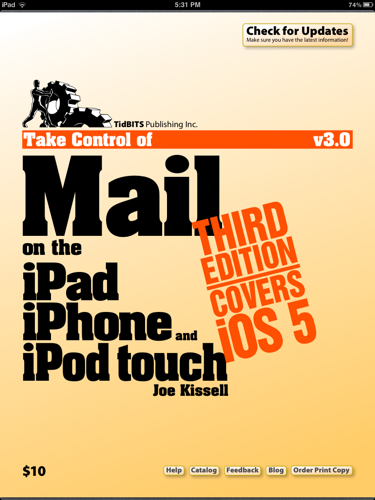 TidBITS Publishing’s Take Control Series of eBooks has the answer to just about any question you may have about iOS Mail in Take Control of Mail on the iPad, iPhone, and iPod touch, by Joe Kissell. At only $10.00 USD, Take Control of Mail is an affordably-priced PDF-format eBook. At 108 pages in length, it’s an easy read as well. 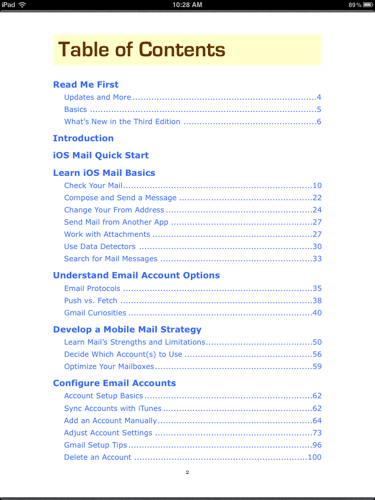 Don’t be fooled by its low price and modest page count, because the book is jam-packed with information about every feature in iOS Mail. I constantly use it as a reference to answer any questions I have about setting up mail accounts and troubleshooting issues. 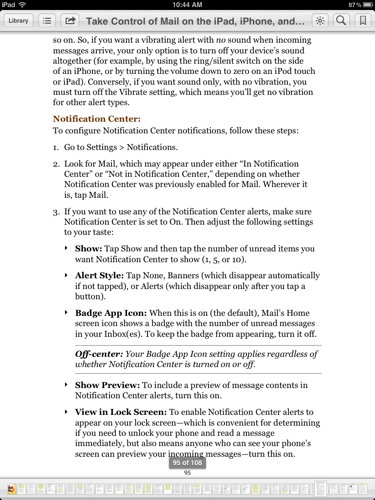 It’s the best authority on iOS Mail I’ve run across to date. Aside from covering the basics on accessing and reading your email, Take Control of Mail also gives thorough explanations of all aspects of setting up new email accounts in Mail. 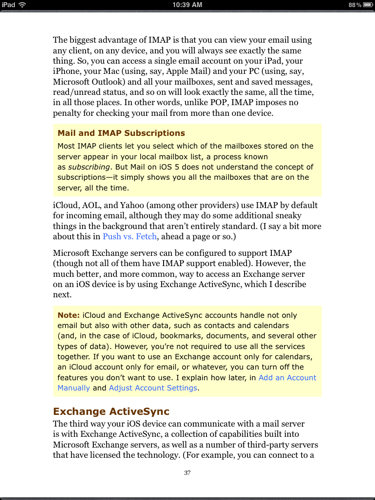 Instructions on setting up iCloud, Gmail, Yahoo, AOL, and Hotmail accounts are clearly written. 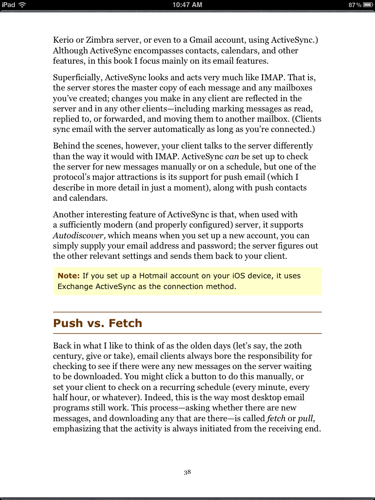 Confused about IMAP, Exchange ActiveSync, or POP? You won’t be after reading about it the email protocols section. Take Control of Mail also give tips on setting up your mailboxes more efficiently, handling attachments effectively, finding messages, and methods of notification of new messages. Integrating Mail with other apps can be a pain at times, but Take Control of Mail also helps answer questions about setting up Mail to work with Calendar and Contacts with fewer hassles. I also found the answer to a question I’ve wondered about but never took the time to find an answer — should I push or fetch my messages? I’ve never been disappointed with any of TidBITS Take Control series of eBooks. They’re well-written, authoritative reference pieces for anyone wanting to get the most out of their Mac or iOS device. I can’t recommend Take Control of Mail enough.